Ottawa Sun LACK RAPIDS -- Pass through the locks at Hog's Back and into Mooney's Bay, and you bid farewell to the most urban area of the Rideau Canal. It's here where the narrow channel Col. John By's men excavated through the pre-Ottawa swampland gives way to the less constricting spaces of the Rideau River proper. And while the city's proximity can still be sensed in the close-packed houses looming over the Rideau's banks, the small docks and accompanying runabouts already becoming commonplace in backyards along the shoreline provide early evidence of the thriving boat culture that lies ahead. There's not a lot of time to build up momentum, though, because in only minutes the dam and lock station at Black Rapids rear up across the river. The chink of winch chains is noticeably absent at Black Rapids Locks, one of only three stations on the canal equipped with automatic, hydraulic doors in 1967 in an abandoned attempt by the federal Department of Transport to "modernize" the Rideau system. So incensed was the public at this violation of the canal's historical integrity that DOT scuttled the project almost as soon as it began. To ensure nothing of the sort happened again, Parks Canada -- awarded control of the system in 1972 -- pledged the canal would from now on be "maintained and operated with special regard to (its) important historical value." LONG ISLAND -- The imposing stone arch dam and three ascending locks at Long Island serve as a demarcation point separating the farthest-flung tendrils of suburbia from what was until recently a long strip of farmland and light forest. That's changing -- as the ever-extending stretch of gleaming new homes perched along the Rideau River around Manotick, nicknamed Millionaire's Row, will attest -- but the 171-year-old dam's original function hasn't changed. It's at this station that lockmaster George Buys controls the water levels for the entire Long Reach, the 45-kilometre stretch of water between Long Island and the next set of locks at Burritt's Rapids -- the longest lock-free portion of the canal system. Every morning, Buys checks the lock station's metre board to ensure the water level remains a constant 85.5 metres above sea level, give or take five centimetres. 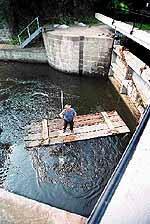 If adjustments need to be made, he removes or adds logs to two adjustable dams -- one across a swing bridge to the side of Colonel By's 7.6-metre mortarless dam, the other upriver near Manotick -- to allow more or less water to pass through. The water management is done not just to appease finicky property owners along the Long Reach who get upset when the river edges up on to their lawns, but to ensure that there's actually a river there for boats to traverse safely. Before By and his men ventured in to the region and started damming for the Rideau Canal, Buys explains, the Long Reach was nothing like the smooth boating passage it is today. "It may have been a set of rapids at certain times of the year, but the water then would disappear and it would become kind of a glorified stream, with a few swamps in between," he says. "There was a kind of a river there, but it was strictly a seasonal river." The gregarious Buys, who began his career as a lockmaster in 1980 as a summer student on the Ottawa Locks, also affixes a name to the iron winches lock personnel have used to crank the heavy oak doors open and closed since 1832: "Crabs." "I really don't know where the name comes from," he says. "Maybe because they just sit there and look like crabs." Canal worker Ray Brown repairs a cable at Old Sly's Locks near Smiths Falls before the arrival of a convoy of boats. BURRITT'S RAPIDS -- If there's any area indicative of the changing character of the Rideau Canal, it's the Long Reach between the lock stations at Long Island and Burritt's Rapids. The undeveloped land and rolling cattle pastures of old are still there, but over the past 30 years or so many of the farmers who used to own larger tracts of land along the Rideau gave in to demands to sell the highly prized waterfront property. You can feel the city encroaching gradually in the angular roofs and elaborately terraced lawns of the expensive modern homes planted at semi-regular intervals on the banks. Still, as Burritt's Rapids draws closer, the pseudo-suburbia of Manotick gently yields to lazy pastures. In fact, Burritt's Rapids itself -- a modestly sized community of about 20 families during the 1830s, when the canal was finished -- may actually be quieter than it was 160 years ago, now that the bustle of its once-thriving saw, grist and woolen mills has died down. "The rapids have all dried up and the Burritts are all dead," jokes Jack Arnold, who's manned the local locks since 1980. On this particular afternoon, he's been kind enough to offer his pickup truck for an emergency gas run. The 10-minute drive gives him ample time to expound upon why he's stuck with the much-envied task of locking boats for 17 years. "There's a basic philosophical ideal behind the whole thing, which is helping people enjoy their vacations, helping them unwind," he drawls. "I like that. What could be more worthwhile? "It's long hours in the summer, but it's a healthy environment. We've got blackflies in the spring, mosquitoes and deerflies. But I'd rather live with that than air-conditioned air and fluorescent lights, tucked away in a cubicle away from a window. And even with the paperwork, when I'm sitting at my desk doing the revenue statement ... I look out the window and what do I see? Hello. This is great." MERRICKVILLE -- Two lock stations and three locks later, the steel skeleton of an enormous rail bridge emerges from behind a bend to herald our arrival in Merrickville. Of all the communities scattered along the canal system, the self-proclaimed "jewel of the Rideau" -- incorporated in 1793 -- is probably the most conscious of its historic ties to the waterway. To this day, the village has used that relationship as the basis for a lucrative tourism industry. "The canal was a boon to Merrickville," the late writer Larry Turner once observed. There's more than a touch of historical irony in the fact that it was William Merrick who helped delay the canal's opening by a year in 1831 when he dammed the Rideau River to do some repair work on his mills. That rendered the downstream portion of the river completely unnavigable. With a population hovering around 1,000, Merrickville is essentially the same size it was when the canal first cut through the village centre during the 1820s. But whereas the population once toiled in the foundries, tanneries, cooper shops and saw and grist mills energized by the commercial corridor flowing through town, a good portion of it now labors in tourist-targeted gift shops, restaurants and hotels. "With all the operations in town, there must be 300 tourism jobs in Merrickville," says Gary Clarke, a local tourism booster and the owner of Sam Jakes' Inn, a faithfully restored stone edifice overlooking Merrickville's three locks. "The canal is the focal point of this community. There's no question Merrickville wouldn't have a vibrant tourism industry without it and for every boat on the canal, there are 100 cars coming to see the canal. So we get far more business from people who are canal watchers than from people who are canal users." Clarke's own office -- located in one of the village centre's many stone buildings -- stands as a testament to Merrickille's long relationship with the Rideau. The three-storey building, built in 1861 by Sam Jakes himself, originally housed the largest department store between Chicago and Montreal. Across the street, one of the original Merricks operated another store of similar proportions. All of this was going on well before Eaton's opened in Toronto in 1865. "The only reason they could exist in Merrickville was because of the heavy commercial traffic on the canal," says Clarke. The Great Depression and the railroad eventually killed off much of Merrickville's thriving economy. But across from the lock station, near the dam blocking the Rideau River, you'll still find the crumbling foundations of the village's old industrial complex jutting out from a colorful collage of wildflowers in bloom. Tucked below the ruins in a small bay beneath the locks lies another piece of living history, albeit history of a more recent sort: Ayling's Boatyard. Its founder, Peter Ayling, retired last year, 32 years after he bought the derelict 145-year-old Percival Plows and Stove Company building and turned it into a working boatyard. The retirement has been in name only, mind you. Ayling -- a very young 81 -- can still be found at the boatyard on an almost daily basis, rebuilding the engine on his 50-year-old wooden boat, the Belle Amie, or foisting advice upon new owner Steve Flewitt. Just what you'd expect from a man who's spent his entire life building boats to glide through the Rideau's charming waters. "I've always been dabbling in things that float," jokes Ayling. Essentially a self-taught boat builder, he emigrated to Canada from his native England during World War II to help set up the Canadian arm of the British Power Boat Company in Montreal, where he produced motor torpedo boats for the Royal Canadian Navy. "There was no teaching in those days -- you went and did it," he recalls. "That suited me fine because I could experiment." When the wartime demand for military boats and aircraft dried up, he co-founded another boat-building company in Arnprior that developed and produced well-respected wooden cruisers, canoes, outboards and racing sailboats until the early 1960s. Ayling's aversion to working with newly fashionable fibreglass -- "It stinks," he resolutely proclaims -- meant his Merrickville boatyard prospered on restoration, storage and maintenance of wooden boats, although he still designed an occasional craft on request. He was a daily fixture at his yard until last year, when he finally decided he'd reached an appropriate age for retirement. "I still go over there and help Steve out with whatever comes along," says Ayling, who's sticking to building model boats for the time being. "I'm free to go over there and do whatever I want. I know all the people there. They've become good friends." Flewitt is probably grateful for the advice. He's the first to admit boat culture is completely new to him. Born and raised in Toronto, he bought Ayling's Boatyard a year ago. "It's like Eaton's," he laughs. "You've got to keep the name." He bought the yard through a newspaper ad as an avenue of escape from a stressed-out 20-year career in the tool industry and as a potential small-business opportunity for his teenaged son. "I didn't come here to make a bag of dough, I can tell you that," says Flewitt. "I came here for the lifestyle. I got rid of the cell phone and the watch." He now presides over a yard filled almost exclusively with wooden boats of varying ages and states of repair. The more ornate resemble floating grand pianos or country-cottage living rooms; the more run-down he jokingly refers to as "cordwood." But, he says, there's something very appealing about dealing daily with people who spend five or six years diligently turning cordwood into carefully crafted water-bound works of art. "Wooden-boat owners are different -- they're hobbyists, they're economy-oriented, they just love wooden boats," explains Flewitt. "There's a significant difference between them and a guy who wants to go boating and that's it, and who's on a fast-paced job and a fast-paced lifestyle. He just wants to come down on the weekend, turn the key and beat it. "But with these things, once you get 'em set up they'll run a season, but you've still got to do your walk around them and make sure there's no problems developing. They know every square inch of their boat, every little idiosyncrasy they understand. If there's a problem developing -- boom! -- they're right on it." And, he adds, the business appeals to his practical nature. "You can't just phone up a parts store and order parts -- you've gotta make them. You can't phone a wood store and say 'Send me three planks for a 1963 Chris Craft. I want them varnished and ready.' "
The most challenging thing about Flewitt's career change may be in sustaining the wooden-boat culture that's gradually dwindling along the Rideau Canal. His core clientele is retired, and the high-maintenance world of wooden boating is a tough sell to youngsters raised on fibreglass runabouts and Jet-Skis. "One of the things I like to do here is encourage the young people," he says. "These are the future antique and classic boat owners." 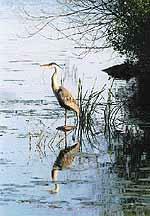 A blue heron is silhouetted against the still waters of the Rideau at Edmonds Lock at dawn. One of the regulars at Ayling's Boatyard is David Brett, who serves as vice-president of the Friends of the Rideau when he's not restoring the Iron Duke, a replica of a 1920s Birmingham Canal tug he brought over from England in 1985. With the Friends, Brett -- another expatriate Brit -- has assisted in a number of ventures designed to boost interest in the canal. The non-profit organization puts together Merrickville's annual Canalfest, for instance, and was one of the proponents of getting canal-corridor communities to call the annual August civic holiday Colonel By Day. His dream project is starting an annual canoe race down the Rideau. "Life is a stress," says Brett, an admitted canal infatuee. "The canal is the fastest way of slowing down. You can't go fast. By the time you make three locks, you've made three friends. And you'll see them again at the next one. You're not blasting by in a welter of spray." Brett has seen the results of canal closings in the U.K., and he's determined not to let the same thing ever happen to the Rideau. "An unused canal is just another weed-filled ditch," is one of his favorite mantras. "I've seen a canal deteriorate so quickly#," he says. "I mean, you leave a lock a year and you'd think no one's been through it in 50 years." A block or so from the Merrickville lock station, Joe Jacques sits amid a yardful of elaborate, hand-built birdhouses -- locomotives, castles, mansions and churches -- and reminisces about his 24 years as a maintenance worker on the canal. "I loved it all the time," he says. "I wish I could have stayed on there, but I'd be taking someone else's job." Until his retirement in 1986, Jacques, 72, spent his days travelling back and forth on the Rideau from Ottawa to Kingston, repairing lock doors, laying buoys and beacons along the navigation route and pulling stopped logs from the waterway. He watched the canal change hands through four federal departments, pulled sunken truckloads of cement from the riverbed at Kars, watched 24 of the 28 wooden bridges that used to cross the canal route disappear. A Merrickville resident since 1946, he's also witnessed what he sees as a turn for the worse in the canal's character. "They've built up all the shorelines," says Jacques. "You've got no more wildlife. You used to have frogs singing along the shoreline at night, but you don't have that anymore. Every lock station, when you came in, was all covered in trees. You could hardly see the locks. Now they've cleared them all." On a more positive note, though, Jacques does come up with an explanation of the term "crab," demonstrating with a miniature hand winch he was awarded upon retirement. "You get your fingers caught in here all the time," he says. This article is reproduced here with permission from the Ottawa Sun. Copyright © 1997, Canoe Limited Partnership. All rights reserved. Please click here for full copyright terms and restrictions.